In karate the finishing blow is known as Todome-waza, and it is explained as a technique that gives the power to a person to destroy or completely paralyze their opponent. This maneuver is often performed with the hand in a fist position. Karate knuckle is a tear of the metacarpophalangeal (MCP) joint capsule that occurs while punching. 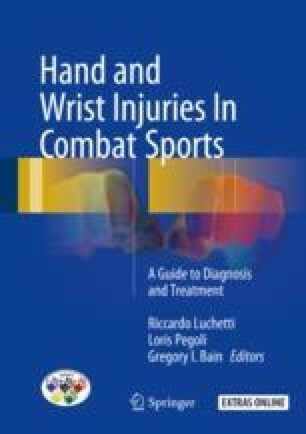 Because of the nature of karate, karate knuckle tends to be a chronic condition and often is associated with sagittal band rupture. In karate it is also important to maintain the wrist position extension during self-defense (Ukemi) and ulnar deviation during chopping. Triangular fibrocartilage complex (TFCC) and scapholunate (SL) ligament injuries can easily occur with these positions. Sometimes a finger injury such as mallet finger with or without a fracture can occur during a spearing (Tsuki) technique with finger extension. The online version of this chapter (https://doi.org/10.1007/978-3-319-52902-8_4) contains supplementary material, which is available to authorized users.